Libya as example of R2P? There have been not a few commentators, from the bleeding hearts on the liberal left to the usual suspects on the neocon right, who have been celebrating the raining down of Tomahawk missiles on Libya as a wonderful return of morality to foreign policy. A few people have asked my how my recent account of the history of human rights connects to the contemporary events in Middle Eastern politics. While I have no expertise with respect to the latter, I have a new post at Dissent magazine applying to the events a distinction between the rights of man and human rights on which my book is based. What to make of the fact that the first historian of human rights was a conservative German nationalist? I explore that question in a new article in the American Historical Review. As Sam Moyn has pointed out in his previous post, the events in Tunisia and Egypt have triggered a revival of sorts of “democracy promotion.” Yesterday, the New York Times ran a feature about “the return of pushing democracy” that explored how current events are used by some supporters of the previous administration to suggest that George W.
One of the interesting features of the current events in Egypt is that they have driven Barack Obama and his administration to a far more significant embrace of human rights language than ever before. Recall that during the last outburst of Middle Eastern protest, in Iran in the summer of 2009, Obama -- having suggested he had learned the lessons of neoconservative universalism -- relied on religious language of "bearing witness" to what happened as repression abroad happened. We might stand idly by, he implied, as repression beckoned, but we should shed a tear and remember the victims. In his impressive review article, Jan Eckel develops a detailed survey of the interaction between human rights and decolonization. Most of all, he argues that the place of human rights in decolonization was both more complex and more ambiguous than has been suggested in the works under review, both my own and Fabian Klose’s German-language monograph. 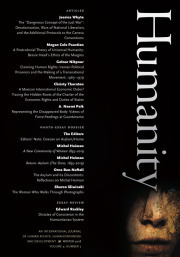 In his review essay “Human Rights and Decolonization: New Perspectives and Open Questions,” Jan Eckel raises many important questions concerning this important topic which only recently has received much attention yet will stay on the research agenda for quite a while. His notion that the history of human rights in decolonization is complex and ambiguous is well taken and hardly contested.